Your computer was unable to start. Oh no! I’m f*cked. I have some kind of virus on my computer and I just lost everything. There’s so much stuff on there that I can’t lose. Projects for school, my own important files, pictures. I think it’s time to start praying for a miracle. I will cry if I lost everything. After this I’m going back to old fashioned paper and pen. No more crashing computers for me. My heart is beating 200 mph right now. I should have bought that stupid hard drive!!! Attempting? What does that even mean? I attempt to get out of bed very morning, but that only works 3 out of 10 times. I also attempt to exercise. That never works. Instead of attempting to repair my computer, do it!!! I’m scared. I can see my entire social media life flash before my eyes. We had so much fun together. So many wasted hours, but always putting a smile on my face. Just please stay away from the virtual light. Come back to me. I’m writing all this in a notebook. My hand is getting tired. What if I never get to share this with you people? Then what? I’m using another computer right now. 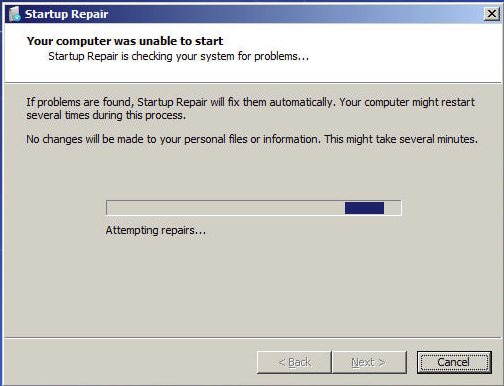 The Startup Repair is still ‘attempting’ to repair my computer. I feel dirty. I feel like I’m cheating. OMG! I fixed it!!! Thank the Lord or Satan or whomever it was that fixed my computer!!! PS. I’m buying a hard drive!! !